Foxit is known for creating one of the free PDF readers most popular. The next step, the most natural, was to create an alternative to Adobe Acrobat PDF file editor that is Foxit PhantomPDF. 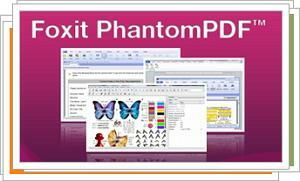 Foxit PhantomPDF is a PDF file editor very similar to Acrobat. So like Adobe is the program that has practically the same structure of menus and icon bars. Moreover, Foxit PhantomPDF is cheaper, lighter and more enjoyable to watch. Foxit PhantomPDF features are classic, and if you are a user of Acrobat will not have big surprises: there are tools to add notes and comments, highlight text or touch, attach multimedia files measure screen elements, encrypt or sealing documents and add forms. Of course, Foxit PhantomPDF also adds its own virtual printer and integrates with browsers. If you need a full PDF editor with similar potency to the reference program, Foxit PhantomPDF is a good option to consider.